The story is set in the early 19th century so if you have any little ones that enjoy "Little House On the Prairie", they'll enjoy this as well. You can read the review here. Every year I look forward to getting my new Linda Nelson Stocks calendar for Christmas. I love her folk art style, especially her snow scenes. 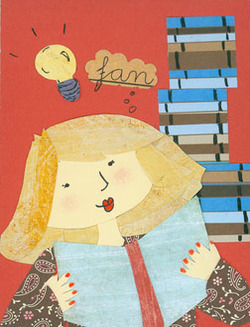 But this year, I've splurged on a second calendar by illustrator pal Susan Mitchell. Her needle felt characters are adorable. When I saw that she'd done a hedgehog, I knew I just had to have a copy! Go visit Linda Silvestri's fun illustration advent calendar. And don't forget to click the image to see the "rest of the story". Such a fun idea! I am at my computer the majority of the day so I thought it was high time to replace my spring themed wallpaper. 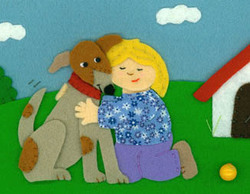 Here is a great one from my favorite softie artist, "jenny loves benny". If you visit her blog she has it on her right side bar for download. Her work is gorgeous, isn't it? 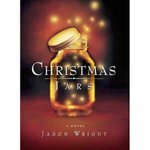 One of my favorite children's book authors, Karma Wilson, is involved with this project. Go here to learn more. And in the mean time, please vote!! How wonderful to get a taste of the LA conference. Thanks Team Blog! Hello my bloggie peeps. Hope you are doing well today. It is pouring down rain here. We've had gallons of it so far this summer. Such a total 180 from the weather in Las Vegas, where we used to live. Speaking of which, we're driving there in a couple of weeks for vacation. Can't wait! Anyway, I wanted to take a time out from work and share this pretty embroidered piece with you. The lovely Lucy at Attic24 makes these little treasures and is selling them at her blog. The one you see above is mine. =o) Seriously, I just commissioned it. Thanks, Lucy! Isn't it delightful? 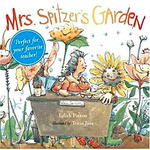 Tara Lazar has created a list of children's book authors and illustrators that are twittering. I hope more start "tweeting", it's a great extension to your existing blogs. Did any of you catch, "Grey Gardens" this weekend on HBO? Immediately after the film, I went online to see if I could find the real documentary and here it is! It's absolutely fascinating. After seeing the true characters, I bet Jessica Lange and/or Drew Barrymore will receive awards for their portrayals. Spot on! 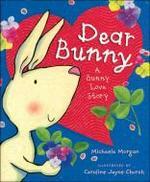 Here is another fabulous video that Just One More Book posted today. It's Diane DeGroat sharing how she created her book,DOGS DON'T BRUSH THEIR TEETH, using photoshop. So interesting! She also discusses her transition to digital. Thanks for providing these great videos, Just One More Book! Hop on over to "Just One More Book" and check out this great video of Lane Smith sharing his process. Totally loving this illustrator's work. Do you know Jill travels to Japan regularly to gather inspiration? Now, that is my idea of fun! I lived in Okinawa for a few years growing up and I would go back in a heart beat!! Bite Sized Jewelry asked if they could use my artwork for the new line of jewelry they are creating and I was happy to say yes. I think I'm going to order some for Emily and my niece. Thank you so much, Deb, Anette and Holly for the "you make my day award." I'm very flattered. How hard to pick only 5. There are so many wonderful blogs out there now. 1. Liz Dubois of Chat Rabbit. If you are planning on giving gift cards for Christmas, pop on over to MY LITTLE MOCHI. 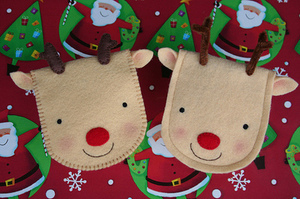 Myra has created the most darling little reindeer pouches . And better yet, she has posted a pattern. I am definitely going to give this a try, thanks Myra! Wow, I think I'm going to have to get this book! Read this review to learn more about the story behind the quilt. Very touching. I've received the "Thinking Blogger Award" from Anette. Thanks, Anette, I'm honored! 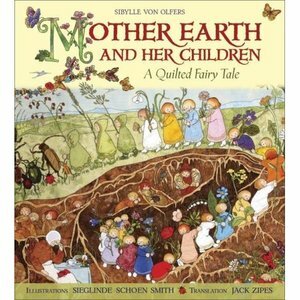 Mother Reader- A mother, a reader and a fun read! Cat and Jammers Studios- A Children's book illustrator who is passionate about what she does. 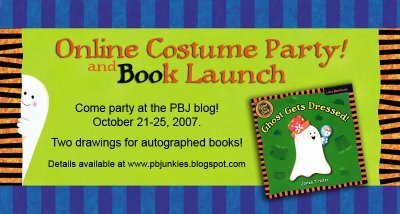 I have really enjoyed reading Barbs journey as an author/illustrator. Inspiring. Her quirky characters are so entertaining. Doodle Girl- A jack of all trades illustrator. I just love reading what she has to say along with enjoying her artwork and textile designs. The Longstockings- Eight writers who discuss areas of interest to writers and readers of children's and teen literature. Although I don't write in this genre, I'm fascinated by what goes on behind the scenes. Pretty Little Things- Lorie Marie is a self taught textile designer who freelances for Pottery Barn Kids. Such a cool gal. Again, I love reading about the behind the scenes. Cat and Jammers Studios- Barb shares her journey in the illustration world. Very inspiring post. Way to go Barb! Green Bean Baby- Another inspiring post about the journey of following ones dreams. 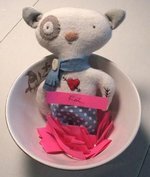 Weller Wishes- Meet Kathy! Check out the neat "toys" she's been playing with. I can't wait to start planning on how to decorate this flake but I have to admit I'm a little nervous now too. I want to do a good job since it will be auctioned off. Please keep Grace and Robert in your thoughts and prayers while they are in San Antonio. My heart goes out to them and all that they are having to face. Addendum: If anyone reads this and is interested in participating, please visit the link to her site. She is looking for contributors for Aug thru Dec.
Dawbis is creating a cut paper quilt and I am a part of her May edition. 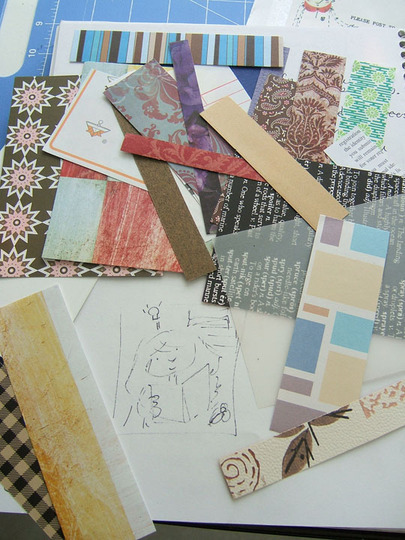 I really enjoyed working on this challenge because you were only allowed to use the scraps of paper that she provided and create something based on the theme, "A day in the life". The striped strip of paper was my inspiration. It looked so much like a stack of books to me. A day in the life of Roz, a "fan" of children's books. The crit group I'm in has started a blog. Drop by for a visit and feel free to comment. 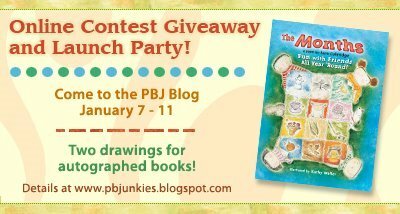 It's a public blog and we look forward to chatting with other Picture Book Junkies! "Want to know what's really on the mind of an editor? Have a peek at Editorial Anonymous, a new blog offering the insights and opinions of a nameless, mysterious children's book editor. There's some fascinating insight about life behind the slushpile, and some pretty good -- if blunt -- advice for writers." My name is Roz and I am a blogaholic. Here are some blogs that are new-ish on my list . Misery loves company and all of that. On the last day of the conference, an awards ceremony was held to announce the winners of the illustrators display contest. A panel of judges picked three illustrators. There were over 150 submissions. What a daunting task, the entries were fabulous! Then Tomie DePaola came to the podium to announce his winner for the illustrator display. Before he announced the winner,though, he wanted to acknowledge 3 other illustrators. Guess what? I was one of those three illustrators. Holy cow, it's a moment I'll never forget! To make the moment even more thrilling, the other two illustrators acknowledged were both friends of mine. * I must confess that I found out the names of all the winners via Courtneys blog. It was such a treat to meet her in person. I'm sure we'll be seeing a lot of her work in the near future. Her 'grandmas' are a hoot! As I write this I am imagining the tune, "I've had the time of my life" playing in the background because I truly did just that, had the time of my life! I regret that I am the lamest photographer in the world. I did try but when I uploaded them this morning the majority are just smudgey messes. What a disappointment. Barb has taken some great pics as well as written a great overview of the conference. I would hightail it over there to get a look, if I were you. You really have to go to one of these things to really get the most out of it. As I sit here looking at the few notes I did manage to jot down, they are lifeless. The delivery of the words and the aura of the speakers brought just as much to the experience as what they had to share. Still, here are a few quotes that I have taken to heart and will cherish as I continue on this journey. I can't wait to go again next year! Such a mesmerizing speaker. Could have listened to her all day. "Don't let the noise of the marketplace drown out the whisper of your subconscious." "I don't know what I'm doing. Really, I don't know what I'm doing." "Don't lose heart, if you find your story out there, change it up a little." Focus more on the quality of the work you are sending rather than just the presentation. "If you're going to wrap an empty box, it's still empty." "Learn to love yourself and your own work. Stand by your work, warts and all." BTW you have to read his book, "Invention of Hugo Cabret". Such an innovative way of building a story with text and illustration. I read it on the plane ride home and it's marvelous. What a delightful speaker he was. So down to earth and transparent. "Struggling and fear is part of the process." "What matters is what happens at the turn of the page." Simply moving speaker. I was either laughing or crying the whole way through. What a storyteller. "Dare failure. If I didn't dare failure I may never have become a writer at all." "Emotional memory, rather than photographic memory." "I'll never be them, I have to be me." I signed up for the Winter SCBWI Conference. I can't believe I braved it! This will be my first national conference. I'm so nervous and excited all rolled up into one. Being surrounded by such talented auth/illustrators! Really, what makes me the most nervous is the thought of getting myself from the airport to the hotel after I land in NY and then getting myself from the hotel to the airport when I leave. I am notorious for getting lost. But like hubby said... just plan to leave really early and give myself plenty of time. This is not my nature but it's going to have to be if I want to stay sane. Oh I'm so excited when I just think about the fun of it all. And guess what? My PBJ crit group will be going as well so it will be like a reunion! I can't wait to see them and also my other online buddies that will be going. Please let me know if you plan on attending, I'd love to get together. I think beyond the exceptional speakers that are lined up, it's just so inspiring to be surrounded by friends pursuing the same goals and dreams. Check out this great blog created by a multi media artist who also is working very hard to build her own rescue shelter. It looks like she will be holding an art auction (is looking for artists to participate I think)to help earn some money for her rescue efforts. Very cool. Go take a look and please help spread the word! Check this out, you may see some "rides" you recognize! Can you tell I'm not very busy with illustration work ? I'm embarrassed to admit that unless I have a deadline, I find it very difficult to motivate myself to create. So here are a couple of links I'm enjoying and thought you might as well. My apologies, I can't remember where I originally found these. I'm still having problems with my current website and had to change web hosts, unfortunately. If you have my link on your website or you've bookmarked me, please change it when you have some time. Sorry for the inconvenience! Surely, you all have seen this already but I wanted to post about it as well because I am such a fan. Check out Ruth McNally Barshaws illustrated journal account of this years SCBWI National New York conference. I just finished and it is a hoot! I want to say a public congratulations to Ruth for selling her book idea to Bloomsbury. She is so deserving and her enthusiasm over it is contagious! It just goes to show again that the "heart" in a persons work really shines through and will grab an editors attention. Yay Ruth! Yay! Just discovered that John Nez has a blog up and running.